I know, I know – this post is long overdue, but my assistant has been away on a family vacation, leaving me with nothing but daydreams of cakes to be made and blog entries to be written. Before she left to explore a bustling and very delicious Hong Kong (egg tarts, dim sum, and noodles galore…with plenty of tropical fruit to boot), she had the chance to craft a birthday cake for a repeat customer. A year ago, Joshua ordered a birthday cake for his wife Mai. This year, he wanted to surprise her with something new. Never having tasted red velvet cake before, he decided to take the plunge and order a triple layer red velvet cake for Mai’s special day. With red velvet now among my favorites in my cake repertoire, I was happy to oblige. However, the challenge came in crafting a red velvet cake that looked pretty. I’ve noticed that so many red velvet layer cakes look homemade (good!) but homely (not so much…), with bright red crumbs poking haphazardly through otherwise white frosting. 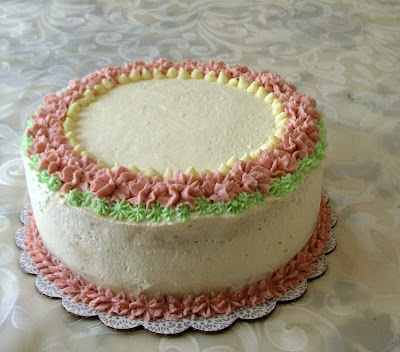 I wanted Mai’s birthday cake to have a neat outer appearance with the bright red interior coming as a pleasant surprise. For this mid-March birthday, I looked to the blossoming spring season for inspiration. 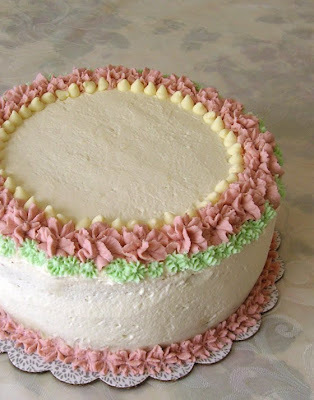 My assistant filled three rich buttermilk cake layers – bright red in color with just a hint of cocoa – with two layers of creamy Bailey’s cream cheese frosting before frosting the assembled cake with a thin coating of Bailey’s buttercream to hide any red crumbs. After allowing the cake to rest in the fridge, she added an additional layer of freshly whipped vanilla cream before piping pink rosettes and a border of green “grass.” Throw in a circle of white chocolate chip “mushroom caps” and you’ve got yourself a cute little garden-themed birthday cake that’s easy on the eyes and certainly easy on the palette. Thanks, Joshua, for trusting me with such an important cake, and happy birthday, Mai! I hope you enjoyed a beautiful spring birthday and a cake themed to match.